2. Dinnerware saving: need no extra dinnerware as the dinnerware can be reused after washing. 3. Furniture saving: save furniture for dinnerware collection, conveyor, cart, table, and storage. 4. Early wash, easy clean: good sanitary practice. 5. Space saving: no space needed for prewashing, collection, rack loading/unloading, and drying areas. Food Maid Company-Dr. Golden Brain’s Laboratory provides custom designs for our client. Dish Feeding System: dishes slide on double PTFE rail and driven by three helical stainless steel rods. Dish Loading and Unloading Zones: can host a stack of 60 dirty 11” dishes. 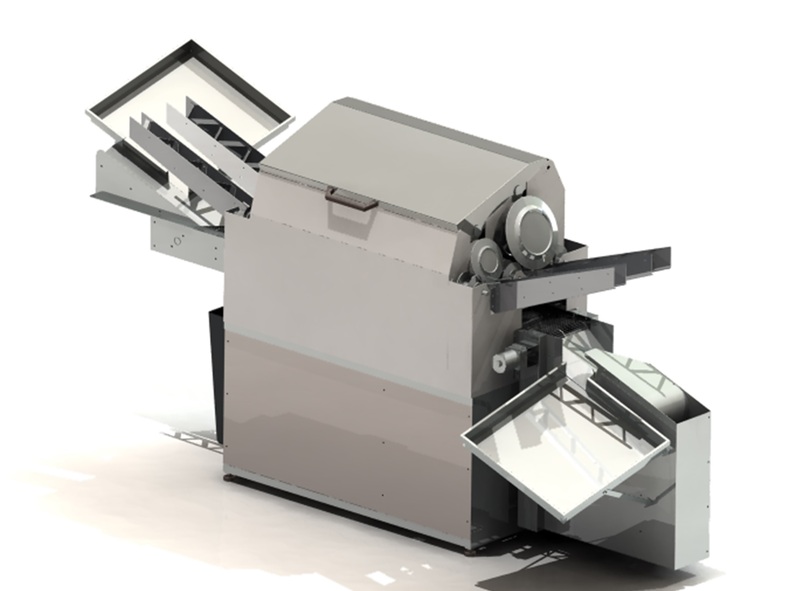 Waste Disposal: Powered filter collect the food waste and dump into the trash can continuously. Mechanical Brush: wire brushes can be mounted to the helical feeding rod and wipe both sides of the dished. Thermal Insulation: double stainless wall sandwiched with PU foam to reduce noise and heat loss. Sorter, flipper and Stacker: sort dinnerware by size and shape, flip the bowl if needed, electric motor driven elevator to adjust the height of dinnerware stack. Drain Line Requirement: 3/4” pipe thread, drain by gravity only. Drain line must be below the machine.